Cappellini means ‘hair’ in Italian. Which is why in America, this kind of pasta is called angel hair. 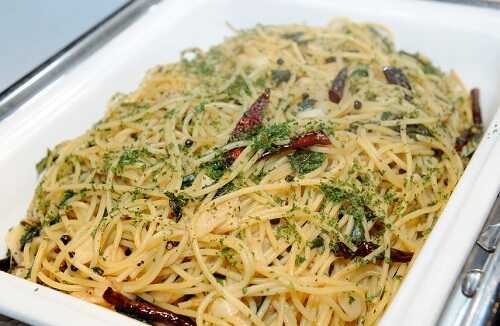 Angel hair pasta is much thinner than regular spaghetti noodles. It can be done with regular spaghetti, bow tie pasta (farfalle), particularly if you have some left over pasta. With a salad and garlic bread, this dish makes for a quick and simple dinner. It also keeps and travels well if you want to pack some for lunch. Start a pot of boiling water for the cappellini with a pinch of salt. Let the pasta cook. Start the spinach by heating the 3 tablespoons of olive in a large frying pan. Add the chopped garlic clove, tomato, and the spinach stirring and coating everything with oil. Add the rosemary, oregano and basil. Cook until the spinach is wilted and has a bright green color. If you have time left until you pasta is done, turn the pan low and wait for it. Add the pasta directly from the steaming pot of water using a pair of tongs. Do not strain the pasta. The starchy water on the pasta helps the spinach, garlic and tomato stick. Stir the ingredients together on low heat until it is all mixed in. Add parmesan cheese, stir it in and serve.